Yoga is an effective exercise whether you’re aiming to lose weight or get rid of stress. However, although beneficial, it doesn’t mean that every pose is right for every person. Like most forms of exercise, there is always a risk of injury. To help you stay safe while practicing yoga, here are 8 things you can do. Warming up is as important as your yoga routine. It’s meant to raise your body and muscle temperature to prepare your whole body for the poses. It can also reduce stiffness and prevent strain on your muscles and joints. Warming up for yoga doesn’t have to be a complex process. In fact, you can start with gentle stretches and establishing breath awareness. Find your rhythm as you do your warm up. Yoga is all about focusing on where you are. As such, it’s important to be in tune with your body. Don’t rush into complex poses just because you “think” your body is ready for them. That is a sure way of ending up with injuries. If you are a beginner, for example, don’t expect and force yourself to do a headstand right away. Don’t feel pressured about perfecting a pose as soon as you land on your mat, too. Stick with beginner-friendly classes and master the basics. Once your body is ready, you can take on more advanced classes. If you are having a hard time doing a pose, don’t hesitate to talk to your instructor. 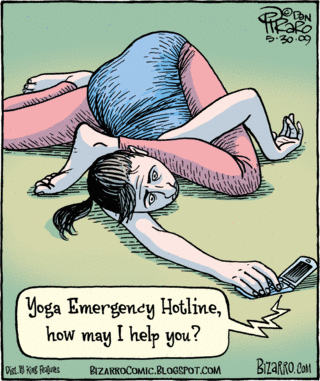 Do the same if you have existing health issues that can prevent you from performing the yoga poses correctly and safely. In case a pose just doesn’t work for you, stop doing it and move on to other poses. Pay more attention to the ones that provide you and your body benefits. Don’t feel embarrassed about modifying poses just to fit your current health condition. If you recently had a knee surgery, for example, forcing yourself to do a complete Lotus Pose can spell disaster. Now, if you’re unsure about how to modify certain poses, ask your instructor. She will be able to show you how to work on a pose without compromising your health. A fast-moving class can ingrain poor alignment habits in you as you try to keep up with the pace of your instructor and the rest of the class. The more you do yoga like that, the more damage you’re creating in your muscles and body. A home practice can allow you to focus on areas your awareness hasn’t reached yet. It will give you time to assess which areas are too stiff or tense and which body parts are too loose in certain poses. Giving yourself enough time to do yoga on your own can help you realize the things that are holding you back. With yoga, you’ll get to see a lot of stretching. This, however, doesn’t mean that you should hyperextend and lock your joins during poses. Doing so can wear out your joints faster. Instead of locking your joints, engage your muscles around your joints so you can gain better stability. Remember, always be gentle with your body even when you’re doing exercises. After a long and tiring day, it’s easy to feel excited and head out the door as soon as you’re done sweating out. While that sounds reasonable, skipping savasana or the final resting pose of a yoga flow can hinder your nervous system from slowing down. Savasana is also known as the Corpse Pose. It’s meant for deep restoration and relaxation. It’s therapeutic for your body in that it stimulates your body’s parasympathetic nervous system, lowering your heart rate, respiration, and muscle tension. This is probably one of the best ways to keep yourself safe from injuries. If you feel any pain or discomfort while you’re doing yoga, stop. If you are extremely exhausted from work, give yourself enough time to rest and recharge before going to your class. You should also avoid overtraining your body as that can only put you at risk of more injuries. Paying close attention to how your body is feeling and watching out for warning signs are imperative for a safe and effective yoga routine.